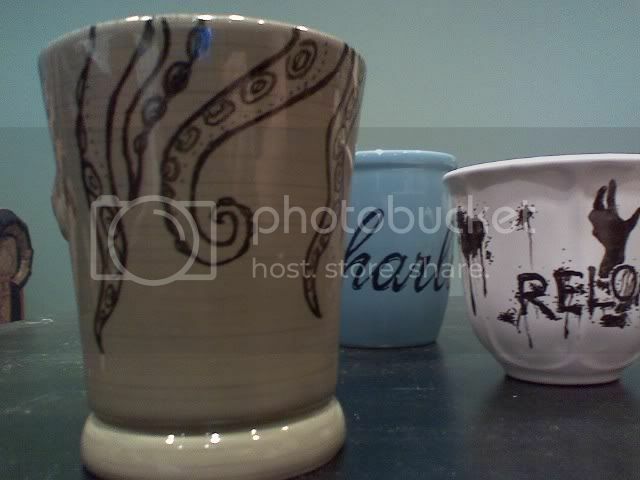 Craftster Community > POTTERY, CERAMICS, POLYMER CLAY > Pottery, Ceramics, etc: Completed Projects > Custom ceramic mugs! Tentacles, Zombies, and Harlots! So I decided for my friends to make their gifts this year, being that I was broke but still thrifty. I bought several ceramic mugs at the thrift store for $.99 each and then purchased one of those ceramic pens that you draw with and then bake it in your oven to make it dishwasher safe. The green mug has tentacles circling the entire upper rim of the mug. The blue one has "harlot" in fancy script. 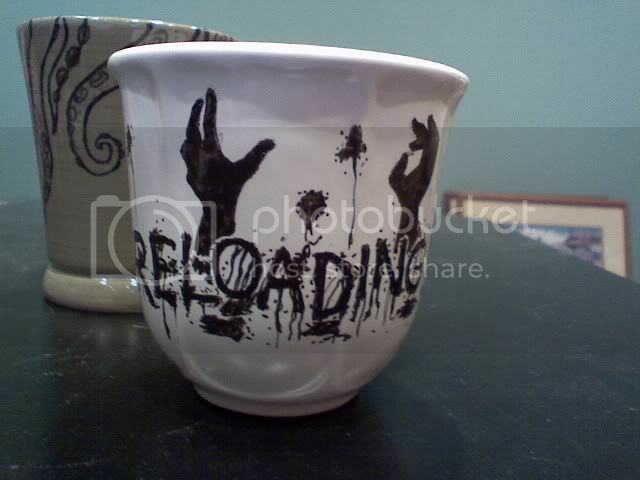 The small white teacup has "RELOADING!" and zombie hands and splatter on it (ode to L4D). No stencils were used. Comments and crits welcome. Thanks for looking! The brand of paint pen I used was Porcelaine 150 by pebeo and I bought it at Michaels. It's a fine tipped ceramic paint pen. They come in tons of colors and multiple tip sizes. "Porcelaine 150 can be applied to all heat-stable bases that are able to withstand a temperature of 150°C (300°F), such as porcelain, china, glazed earthenware, terracotta, metal, enamelled sheet steel, copper and glass. The choice of base enables numerous effects to be produced and experiments to be made with the transparency and intensity of the colours." With the glazed ceramic mugs I used, the mug should be cleaned thoroughly with alcohol before applying the paint or else it won't adhere properly. Please keep in mind that these mugs are hand washable only. Sticking them in the dishwasher will destroy them. 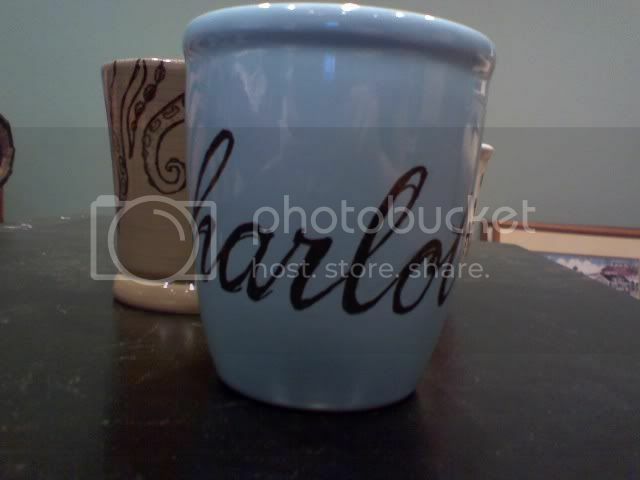 I thought the paint pen would be easier than just the regular ceramic paint and it was. It works like any other paint pen with the pumping mechanism and the shaking. The only thing is that the paint sets up quickly so if you want a smooth surface to your paint then work on one small area at a time. If the paint dries and you want to change the design or fix something before you bake it, I used an exacto knife to carefully scrape off the paint. Also, be patient with the paint pen because the tip will get clogged. I suggest keeping a scrap piece of paper or paper towel to help un-gunk the end and make sure the paint stays running. Once again, thanks for the featured projects and all the wonderful comments! 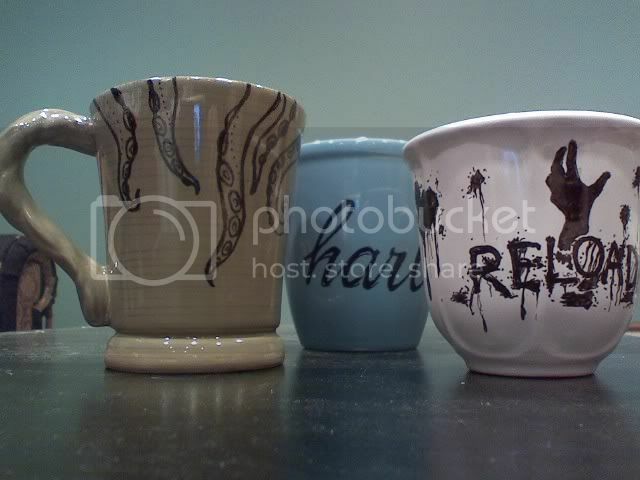 Re: Custom ceramic mugs! Tentacles, Zombies, and Harlots! those are really nice! i like the tentacle one a lot. awesome. each one of these are super cool. i really want one of those pens now. Thanks very much! The pen was about $4 at Michaels, so it's not too bad. It's a BOY! Due FEB 22! These are so cool! Was the pen easy to use? any tips before I try it myself? Those are so cool. Way to be thrifty! Thanks for sharing. I've never seen these pens - but now I'm going to go search for them! Your mugs are awesome! You are very talented and I'm sure your friends will love them!